Other sectors are weak too, but one sector is hot. The private bank I used to work in managed to stick $500m into Blackstones $18bn Q1 2016 US commercial real estate fund. Nailing the top for this cycle. The only reason the chart isnt far worse is the tardiness of Clamity Janet with interest rates at 1.25% when in the last cycle they were at 5.25% when U6 was below 8%. Warehouse space is at a premium in a lot of the country. If it were for cannabis nationwide, we might have a happier country! We had clients invest in a private industrial real estate fund earlier this year. It’s primarily new warehouse space (these places are HUGE– like multiple football fields large), located around the country in various ‘distribution corridors’ (think sections of the country where major highways intersect that are near big population centers). Their main customer is the Amazons, Walmarts, etc. of the world– basically e-retail. Places to keep lots of unsold stuff? So you postulate the cannabis industry requires these huge, multi acre concrete warehouses? Ever peak inside one of these cavernous monsters? I assert that just one would hold enough grow and storage facilities to support the marijuana needs of the entire state for a year or more! That’s the wonder of financialization: When there’s an overhyped bubble of tulips, cannabis or whatever, there’s tremendous malinvestment, like in China. Lodging seems headed for the same trainwreck as retail malls. Some offer weekly and monthly rates, but the group is over built. Also some cities are raising the hotel tax, to pay for infrastructure they stiff the tourists. San Diego was going to build a new football stadium using a hike in the hotel tax, the team went to LA instead. The seasonal rental business is strong though NIMBYs pushback and low income motels have a reputation for crime. The cultural shifts like in retail malls, will make a difference. The only thing we learn from history is that we don’t learn from history. This time is never, ever different in its end, just in its end games. I begin to believe that it is not about learning from history but the fear of missing out. Even if they understand history, most people could not cope with the fear of missing out. It’s like speeding on icy roads. It’s risky? So what? They arrived at destination faster, with no incident. So you are wrong. That’s the prevailing thinking — they know history but they are convinced they can make tons of money before any downturn. In a sense, they are right. It’s like going to the casino. You can’t tell them they shouldn’t play because the house has better odds. They will tell you that every day, someone walks out of the casino a winner. As long as there is no crash, they are right, and you are wrong. You’ve done a great job describing why people are speculating in what would appear to be a bubble and I like your analogy of speeding down an icy road – you may arrive safely to your destination this time but if you make it a habit you will probably have a wreck in your future. On the other hand, what if the central banks decide to never allow markets to correct. The current bull market has had some bumps along the way but each time the central banks rushed in to support the market – what if these market interventions are now a permanent mandate? What if markets aren’t going up but instead currencies are actually going down? In that case the road isn’t really covered with black ice and the driver speeding down the road is not in really in danger – he may actually be taking the safer course by arriving at his destination before it gets dark. Interesting but depressing for savers like me and for those staying on the side lines — we are going on reverse, on a safe road. On the other hand, those speeding down the safe road may feel more and more confident and go ever faster; then one day, a deer jumps out onto the middle of the road. This is why there is a bubble. There is a belief out that that the Fed can protect everybody by providing liquidity when needed. The problem is that stocks prices and greed keep rising. With speculation this high, the Fed is forced to increase interest rates to prevent the bubble from rising quickly and exploding. Thus, while Fed may like high stock prices, it doesn’t want them too high. I expect the Fed would like to see a 20% drop from here, and it will keep increasing interest rates until that happens. The Fed will of course support markets, but it will not support insane markets that are an immediate threat to the world economy. Wait for a 20% dip, then buy. Keep a chunk in reserve in case the drop gets out of hand. Down 20% is essentially back to prices 12 months ago. Still in bubble territory by many measures. The central banksters only blow bubbles which can’t last forever. Show them a chart of the Dow Jones Industrial averge from, say 1920 to 1940. Only time will tell if we are at the tail end of the stock market bubble, but it certainly looks like 1928 or early 1929 for the FANG stocks. Unfortunately, the Fed has made the bond market look like a suckers’ game. I haven’t bought a bond since 2011. Between 2011 and the election in 2017, long dated treasuries (e.g. 20-30 year) had returned nearly as much as the S&P 500. That gap has widened significantly since then, as yields spiked after the election and the market took off, but that gap can narrow in a heartbeat if there is any decent sized sell off in the future. Keep in mind , Intosh, that these are “paper profits”. – Are there any stocks or that are (heavily) invested in CRE ? Are there any ETFs listed ? I’m near the San Jose airport. I’d consider it a fairly “prime” area simply because it *is* near the airport, it’s easy to get to by two different freeways, PayPal’s just up the road, bunch of other well-known tech companies too, but the number of empty places is amazing. I’m talking about 1000-3000sf but bigger too. Just up and down Brokaw Road, there are tons of empty store fronts – not typical retail, but places that sell commercial fasteners, do circuit boards, sell safety equipment, as well as an (expensive) exercise gym that’s open late, a place that sells billiards tables, etc. These are the places still there. But my friend and I had no problem finding a place for $1/sf that while it’s not in the most beautiful location (it’s across from a cement plant) is perfect for our needs. There are a lot of places to choose from. Even downtown, there are more empty buildings and store fronts than there were 5 years ago. The financial results of the publicly traded companies in the US (whole globe?) are very narrow. All of the profits of the S&P500 (maybe all?) companies are in the top 200 earning companies. That means that for every $ earned in the lower level companies, a $ is lost by another company. Some huge percentage of all the profits in the world over the past 10 years have been earned by Apple, for example (sorry I don’t have the numbers in front of me). So, you get the modern CA economy: half of the richest counties in the US, but the highest fraction of people living in poverty of ALL of the states. Also, the 8th grade public education achievement (tests) are down to #46 (yes, CA is down there with the poor southern states). The homeless problem is significant. That is modern CA. It is most definitely not the state I grew up and was educated in. That is sadly gone. The government in power for the past 20+ years has given this result, mostly the state government, but the US federal government has done its part. We can’t keep financializing and bailing out all the companies and governments that keep blowing up. Failure has to have pain associated with it so other companies and governments avoid it in the future. (see: moral hazard). I’ll be interested to see how Jared Kusher’s investment in the 666 Fifth Avenue, Manhattan office building turns out. I think he should have declined to serve in the Trump administration and looked after his real estate interests instead. He may turn out to be one of the biggest losers during the Trump years in Washington. Don’t worry, the Saudis have it covered. He’s been there recently up chatting upto 4 a.m. with the new Crown Prince. Not just on-line retailers taking business. I’ve heard that Air BnB is taking a big bite out of the lodging sector. And is growing. Will the Fed will be buying a bunch of this craptacular CRE paper when it starts to really crater. At least from their biggest members? The index for the lodging sector is down about 12% from its peak in 2015. It is now about 10% below 2007 bubble peak. The Fed buys mortgage backed securities that are guaranteed by the GSEs (Fannie Mae, etc. ), both single-family and multi-family — so apartment buildings. That’s something to watch. But it doesn’t buy lodging-backed securities because they’re (not yet) guaranteed by the government. Anecdotally I’ve noticed rates at mid-range motels/hotels, through Priceline/Hotwire and such, going up substantially in California in the last couple of years. Which surprises me because I keep reading how Air B&B is eating that sector for lunch. Ditto. I just paid $200 (incl tax) for the Courtyard by Marriott Oxnard! Even the 1* where you might get shot in the parking lot were charging $150. Sheesh! raising prices in the face of declining demand keeps profits up, and then one day it doesn’t. as to CRE, too much cap rate compression, and too much, well, a lot of too much. but what do i know, i’m just beginning to learn the real estate business. They recently opened a hostel in New Orleans to compete with hotels and Airbnb. A cheaper bunk bed in a safe shared room, for those that can’t afford Airbnb or a hotel. The trend is towards cheaper everything because the working class has no money. There’s long been an Indian hostel that’s $20 a night in New Orleans. I’d happily pay that and smell curry all day; I like curry. I suspect there are a lot of places like that. “The working class has no money”. I say otherwise. If that’s the case, we would already be lurching in a crisis. I’ve just realized for the first time how much support the government is giving the unemployed. The govt gives very little support to the unemployed. They put a lot of conditions on all their programs so people can’t or won’t sign up. My husband lost jobs during the financial crisis and didn’t qualify for benefits because you have to have 20 months of continuous employment to qualify. A string of temporary jobs isn’t enough. Even when we had no income and no assets we didn’t qualify for govt benefits. Food stamps did give us $79 one time. This after decades of being a taxpayers. However, had we been illegal immigrants they would have given us housing, food stamps, and third party charity money, and endless scholarship money for our son. The brutality this country visits on its citizens never ceases to amaze me. That should be easily solved — simply renounce your citizenship, and then you too can enjoy the sweet, sweet benefits that you believe illegal immigrants revel in. I don’t comprehend this persistent myth about some secret super-generous welfare system of free stuff only available to illegal immigrants. The ones in my town toil at hard crappy jobs, ride old bicycles and live in high density in crappy housing. I would definitely pretend to be an illegal. In fact I’m going to pick a country I want to be deported to. My comments were about the state of Florida. The only reason we got the $79 in food stamps is because I speak Spanish and was able to use the Spanish telephone line to apply. I spent many days trying to use the English line first and nobody ever answered on those lines. The Spanish lines pick up right away. There are lines for other foreign languages as well. In fact they sent me the paperwork I needed to fill out in Creole. In Florida all illegals get a payment of $1400 for just showing up. I don’t remember whether that’s a state or federal payment. They also get temporary housing and private charity money from multiple sources. We didn’t qualify for any of it as citizens. The only charity we got came from a food bank we used a couple of times. In order to renounce your US citizenship there are a number of steps you must take. You can not just say bye bye. You have to actually renounce in front of an official from the US consulate or embassy. Plus with the demand from people increasing IIRC the fee is ow US$3400. Finally, you have to fill out a nice form from the IRS to make sure that you have paid all your taxes for the past five years AND if you have over a certain amount of income or assets there are more rules and laws to follow which may include making you pay an exit tax or tax for another five years after you leave on your income. Easier for an illegal in the USA to scam the system than a normal citizen to claim benefits or actually give up citizenship. I should have done it years ago when it was cheap and easier. Your comment about qualifying for govt benefits just isn’t true, Petunia. I help my mother with the paperwork that keeps her enrolled in many of the programs you mention. She is in her 80’s, born in Virginia and makes $800 a month in Social Security. I go with her to the welfare office, and the staff here in CA is professional and fairly administers these programs. You either qualify or you don’t. Please don’t call me a liar. I didn’t live in CA and obviously the state of Florida has different qualifying criteria. We got $79 from food stamps and not one penny more. We sold our wedding rings after over twenty years of marriage to buy groceries and keep the lights on. To this day we haven’t been able to replace our wedding rings and we probably never will, it’s a reminder of how bad things got. Just yesterday I was reading the Miami papers and the Haitians are complaining about their benefits, non citizens specifically. That government assistance may help people subsist, but it’s not going to do much for a mass consumption-based economy, which CRE is still predicated on. This is what the Sheeple are voting for every time they pull the lever for a Republicrat Duopoly candidate. When the sheeple vote for predatory capitalism’s enablers, they lose the right to complain about getting what they voted for. NAFTA, welfare reform, and the crime bill were signed by Slick Willie. And I’m still embarrassed to admit I voted for him the first time. At least the other side doesn’t pretend to care. The issue with AirBnB will be its regulation (see recent regulations implemented in French Quarter) and NIMBYism amongst residents in multifamily structures who rightfully are reticent to open their complex to possibly dangerous/disruptive transients. I live in a complex owned by a publicly-traded REIT and if I was caught listing on AirBnb, i’m pretty sure I’d be evicted on the spot. Morgan Stanley posted a report recently documenting these regulations’ effect on growth in heavy-tourism markets such as New York and New Orleans. The real issue for hotels is new supply. The market is definitely overbuilt and some homogeneous “boutique” properties may end up being re purposed into much needed housing in dense/overbuilt markets like New York . On the surface things look rosy. Now look under hood at the CMBS sector. eg: mutual funds, trusts, exchange traded funds, bonds, etc. Are in a turmoil of liquidity capital flows, as wealth seekers not only seek a safer haven, but one with yield, no matter how small. Many of these financial products that are commercial mortgage backed, have found their way into derivatives, compliments of the big Wall street banks and sold to customers around the globe. Many buyers are pension funds and sovereign wealth funds, with some systemically important central banks owning large portfolios of these toxic instruments. Not a question of ‘if’ these financial products turn sour, its a question of when. Indications abound that this is now the case. As they rot on balance sheets and the pressure builds, the subsequent blow up will be epic. The narrative which says the FED didn’t expect this bubble or is worried about it is comical. The FED purposefully creates bubbles and then bursts them, making money for the big banks on both ends. The FED’s mandate is to extract wealth from the public, using sophisticated monetary strategies combined with deep, thorough, and real time economic data which their state of the art big data programs assimilate into useful info that can be capitalized on. But no, they’re just as clued out as the average day trader and know less than the mainstream media puts out on a daily basis. If you believe that, naive doesn’t even come close to describing you. Agreed. The poker faces are just that. These guys are the hungriest sharks available, and the quantities of money are so gigantic – trillions – that you can be assured the Fed has its strategies finely honed down to the billions. A few hundred million here and there wouldn’t even show up in the background noise. Meh. I work with a former Fed economist. My impression is they’re mostly nerdy academics who live in a world of models and have trouble understanding anything outside that, as for most of them it’s all they’ve known in their professional lives. yep, and some people find that nefarious. And what are you going to do? I guess so. Amen. These gold-collar criminals and their bankster cohorts are not the bunglers some in here choose to believe they are. Rather, they are the most brilliantly successful fraud syndicate and wealth transfer racket in human history. One of the most overbuilt sectors surely must be the tourism industry. Decades ago, when I went on a skiing trip, the area almost universally was a mountain village with a few hotels. Nowadays, a small town has sprung up around the still expanding hotels, all fueled by cheap credit, and the re never goes down mantra – the result of serial, continual bailouts whenever the overall market start to crash under it’s own weight. I would have thought that the so called “greens” would have connected this with their save the planet cries, and demand a return to sound money policy, but that would be a wish to far. Go to Japan and see what a real tourism boom is like – you wouldn’t believe it. Huge numbers of foreigners running around and all over the place spending up big. Hotels there are making up for all the previous bad years. Tourism is helping keep the Japanese economy alive and providing jobs and markets for its people and companies. How can it be a “Green Street Property PRICE Index” while supposedly measuring property “values”? If the present bubblicious climate has taught investors/bettors one thing, it’s that there are no longer “values”, at least certainly not for everyone, all the time…only “prices”. The obvious solution is to have Fannie/Freddie cover Commercial Buildings as well. Heck create a new body called Commie (pun intended). 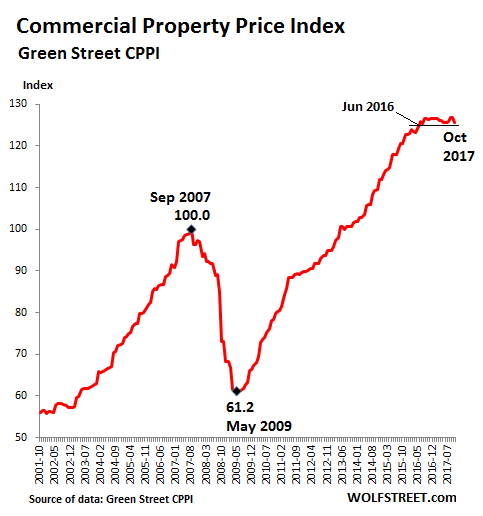 The Fed’s concerned about Commercial Real Estate NOT because the price is too high, rather it’s because they can’t buy these directly through QE. CRE is going to look like a walk in the park compared to what’s coming down the barrel at residential real estate. In Colorado at least, this includes warehouse space for the marijuana industry. Not to start an argument, or get too far off topic, but responding to Petunia above, many of the things you have said about welfare programs are misleading , if not incorrect. My wife worked in our state’s DHR program for 30 years; two in Aid to Dependent Children and 28 as a Food Stamp supervisor. Our state has no Welfare Program for adults, save food stamps for which there are asset limits. These programs were designed to help people survive, not to keep people in 3,000 sq. ft. $500,000 homes and driving 2 $50,000 autos. You can always find anecdotal accounts of abuse and misuse, but there is nothing I have heard more urban myths and misconceptions about than Welfare. Except possibly shale oil plays. Night-Train – As a childhood recipient of Welfare and Food Stamps, and an adult recipient of Food Stamps, thank you. Yes, Food Stamps are only awarded if you really have nothing at all. That’s why they were easy to get in central Arizona, because they believed you when you said you have no work; there was no work to be had there. In California they’re more skeptical because there’s work out here. Food stamp and welfare fraud is actually very low. The only fraud I saw was the thing where people would pay you 50c on the dollar for your food stamps. When I was a kid they were actual paper coupons, that people would just buy. These days, it’s an EBT card, and typically they pay you cash and then they either make out a shopping list or you go shopping together, because you have to put in a PIN. And there are store owners who will, say, sell you a carton of cigs and a bottle of vodka for $100 and chalk up $200 in hotdogs, milk, etc on your EBT card. Without Food Stamps this country would be f*cked. I personally would like to see more education on how to purchase and cook foods wisely, but then the snack/junk food industries would suffer bigtime. These days I eat very good food and astonishingly, I’m only spending $150-$200 a month which is about what you get on food stamps. And indeed, there are asset limits, I think it’s $3k or is it $1500? If you own anything beyond your basic clothing, a desk, a chair, a small TV, and maybe a jalopy with 200k on the clock, you don’t get food stamps. If you’ve got more than that, you’ve got to sell it before you get food stamps. Oh – another form of food stamp fraud that actually exists. A poor person had food stamps and no other “income” and they want a place to live. A person who has a garage, a backyard shed, a broken-down RV in the backyard, etc., will let them live in that, and pay by buying them food on their food stamps. Their own food? They must beg, forage, collect cans, hit the food banks, etc. We need more $$ for social services, and less money for war! Close some of the US military bases in Germany alone would free up some welfare money. Ridiculous how Europe is eating your lunch. Close down the military, stop everything else in the budget and stinking politicians would still find a way to spend that money on something else. Raise taxes 100 per cent and it still would not be enough. That it the problem – the spending never goes down and that is why there will never ever be a balanced budget in the USA or here in Australia ever again………….well maybe if the whole system implodes and everything is set back to zero. Thank you very much Wolf! An amazing read on the brick and mortar meltdown.